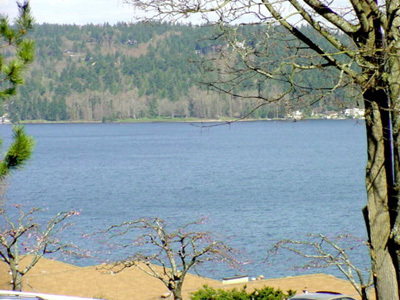 One of three known submerged forest in Lake Washington (the two are on the west and southeast sides of Mercer Island), this site includes trees on a landside terrace about 100 ft below the present water surface. The slide event has been dated at about 883 AD, and related evidence suggests a lake level then of 12-20 feet lower than post-1916 lake levels. 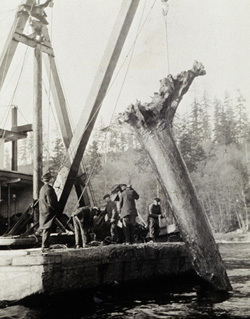 After Lake Washington was lowered in 1916, the treetops near the surface were a navigational hazard. Between 1916-1918 the trees were removed with grapples or the standing tips blown off with dynamited charges to a depth of no less than 30 ft.
1. 1947 UFO Sighting. The first photograph of a alien spacecraft flying over Lake Washington was photographed by U.S. Coast Guard Yeoman Frank Ryman on July 4, 1947. (Seattle PI 07-05-1947). 5. 1996 UFO Sighting. "In 1996 I saw 10+ objects flying over Seattle. Just the first glance make me shiver, proving they were FOR REAL. They were in perfect football formation: 7-8 in line, 3 in backfield forming a perfect triangle. Line was 3 fingers wide at arm's length. Backfield was in the proper football ratio of spacing behind the center and left to right. Saw them in black skies over the lake and in light skies over the urban area. Went from zenith to left horizon in 5 seconds. I lost them in the trees, but feel they went invisible on me. Or the light was polarized or became visible from only certain angles, like an LCD display, or an MIT audio spotlight, if you have ever heard one of them. I was with neighbors using my 7X50 binocs to view Comet Hyakutake on the lone clear night in Seattle in which to view that comet at it's closest. Was 10:30 pm PDT maybe. It was totally obvious they wanted to be seen, flying from Lake Washington over Lake City (Directly West of Area 3), and continued over to I-5 freeway & 145th n.e., the northern city limit. They blinked out at that point 2-4 million people are in the surrounding area. It was warm, summery. A neighbor saw them first, saying they were originally in a flying wing "v" formation, moving at zenith to a perfect straight line-alignment, but imperfectly from side to side. Meaning the "guards and tackles" were not equally spaced. Perfectly ordered silvery spheres, soundless, & I think, interiorly illuminated, no wake, no smell or fumes, turned from visible-to not- on the flip of a switch. About the size of a bee-bee at arm's length, they were intelligently controlled, completely without need of aerodynamic lift or fuels requiring an exhaust - easily seen in backlit condition - almost like a schlerin. Nothing shimmered around them, they were not points of light, but surfaces with area, shape and dimension. Their flying arc seemed as smooth as a CAD drawn curve. Each vehicle was identical, but flying in complete control of their environment as well as being in complete union of "purpose and direction" with each other.